One of the best ways to keep your body healthy and mind sharp is to drink enough water. Proper hydration can prevent or help your body fight many health issues. If you are dehydrated, every organ in your body is affected. 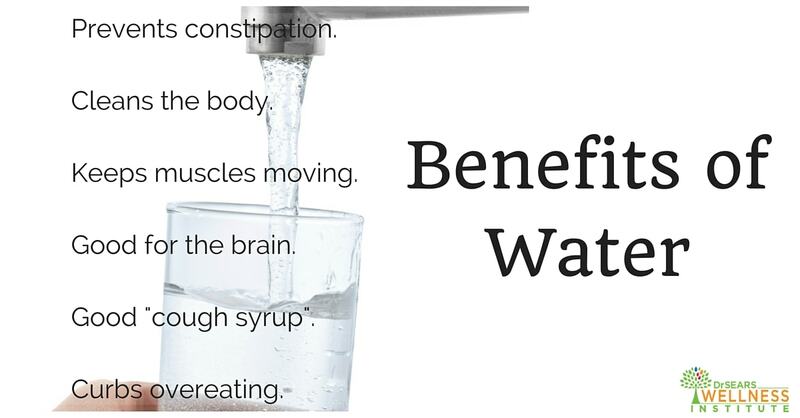 Help yourself feel better throughout the day by drinking a few extra glasses of water. Proper hydration is so essential because 50% of the body is made up of water. In infants up to 72% of their body is made up of water. Water delivers nutrients to your cells and carries waste out of the body. It cools your body by moving heat to the skin’s surface where it evaporates in your sweat and breath. Water literally makes your body run smoothly by lubricating joints, smoothing the skin, making it easier for the muscles to work, and preventing constipation. Be sure to drink more water than usual when you are exercising, sick, pregnant, breastfeeding, hot, or thirsty. Remember, if you wait until you are thirsty to drink water, you are waiting too long. your body is losing water through mucus. If you develop a fever while sick, you start losing water through sweat which needs to be replaced or else you will start to feel a lot hotter. Your digestion is also helped by proper hydration. When your body starts to get dehydrated, the colon steals water from waste making it much harder to pass. Even the brain is healthier when you are well hydrated. Dehydration impairs concentration which makes a long day of work or school much harder than it needs to be. Proper hydration doesn’t mean you need to be constantly gulping down glasses of water. Eating water-rich foods is a great way to help your hydration. Soups, fruits, and vegetables are 80-90% water. Making smoothies is a great way to eat and drink well. Smoothies allow you to mix many nutrient dense fruits and vegetables as well as hydrate your body. Try to drink most of your fluids in between meals. If you drink too much water while eating, it can dilute your natural digestive juices and lead to constipation. Proper hydration is very important at the beginning of the day. When you are asleep your body gets dehydrated so drinking a few glasses of water in the morning is a great way to give your body a head start to the day. A great hydration habit is to keep a water bottle with you at all times. If you have water sitting right next to you, you will be likely to drink more. When picking out a water bottle make sure you are picking one that is safe. Although many manufacturers are now making their plastic water bottles free of harmful BPA chemicals, stainless steel is a better choice. Stainless steel does not contain BPA and almost no seepage occurs. Aluminum water bottles are also a good choice but make sure they are BPA free before you pick one up. Reusable water bottles are a great choice to stay hydrated throughout the day, and they produce much less waste. When your body is well hydrated, you can perform much better throughout your day. Fill up a good reusable water bottle and hydrate for your health! Sears, William. The Family Nutrition Book. New York City: Little, Brown and Company, 1999. 74-87.